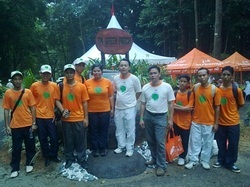 On 30 September 2010, an activity called TM Green Patch which was organized by TM Seremban an officiated by His Royal Highness Tunku Syed Razman Tunku Syed Idrus Al-Qadri on Tampin Mountain. The objective of this event is to circulate the message of natural forest preservation. There was about two hundred participants which were comprised of students and teachers from three schools, including twenty two people from the Tunku Syed Razman Environmental Foundation.